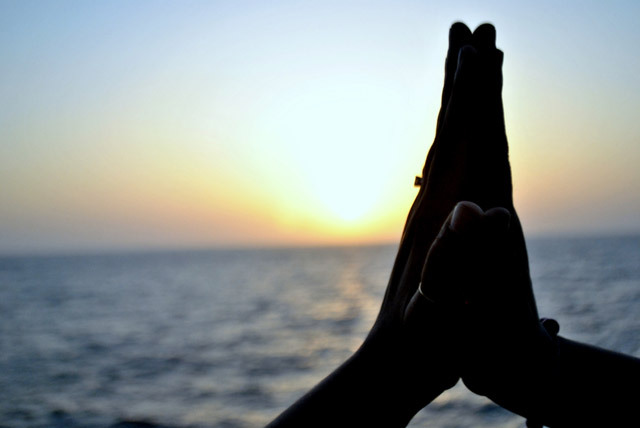 In Sanskrit the word is namah + te = namaste which means “I bow to you” - my greetings, salutations or prostration to you. The word ‘namaha’ can also be literally interpreted as "na ma" (not mine). It has a spiritual significance of negating or reducing one's ego in the presence of another. In Kannada, it is called Namaskara and Namaskaragalu; in Tamil, Kumpiṭu; in Telugu, Dandamu, Dandaalu, Namaskaralu and Pranamamu; in Bengali, Nōmōshkar and Prōnäm; and in Assamese, Nômôskar. Why do we join our hands in the way we do, when we pray?